of corruption” in the reinstatement of the chairman of the defunct Presidential Task Team on Pension Reforms, Abdulrasheed Maina into the federal civil service. He disclosed that he told President Muhammadu Buhari about his meeting with Mr. Maina, long before the news of his reinstatement was made public, adding that it would not in any way dent the reputation of President Muhammadu Buhari and his anti-corruption war. 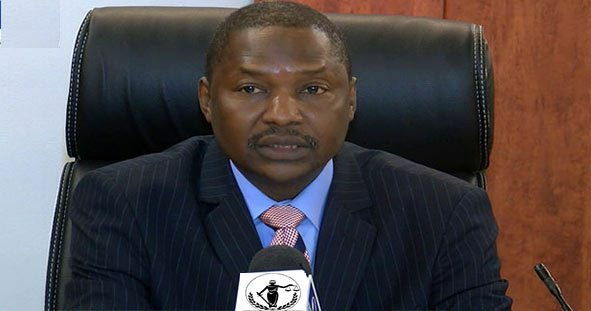 The AGF made this statement while speaking on The Interview, a magazine published monthly, where he also stated that he did not inform the president prior to the meeting. “At the time the meeting was held (with Maina), Mr. President was not aware. But much later, after we returned back home, I took Mr. President into confidence about the information and sought for leave to share it with other agencies with the purpose of blocking leakages. “That was the extent to which the President was aware of the information. He came to be aware of the meeting with Maina much later. It was out of the desire to seek for his directives relating to the information in terms of its application for the purpose of blocking leakages associated with the looting of pension funds,” he said. He also revealed that the National Security Adviser, Babagana Monguno, was also present at the meeting with Mr. Maina in Dubai, adding that he also informed the Director General of the State Security Services, SSS, Lawal Daura, as well and that all the officials agreed that the meeting was in order. “The NSA and I met with him (Maina) at the reception of the Emirate Palace Hotel in Abu Dhabi. He came along with his wife. We were not aware that he was in the company of his wife. He later told me that he was apprehensive, so his wife was lurking around and in the case of any eventuality, she could relate what actually happened. So we discussed. “The discussion happened to be very meaningful, particularly from the point of national interest. It was a time that Maina intimated us to the fact that there exists a cartel, a syndicate within the pension scheme. “The truth of the matter is that what was being paid as pension on a monthly basis was around N5 billion or so. But the actual figure required for pension settlement per month was within the range of N1.3 billion. The implication of what he was saying was that around N3.7 billion or so went into personal pockets”, he said. Mr. Malami said that Mr. Maina told him that that there were 66 accounts that were being used to divert pension funds, adding that the pension syndicate had bought a section of the media. He further said that on returning to Nigeria, investigations revealed that most of the information provided by Mr. Maina was right as it led to the conviction of two individuals and the recovery of looted funds while 12 other cases were pending. Mr. Malami, however, did not reveal the identities of the convicts. The AGF stressed that he would never resign due to the Maina saga. “It boils down to whether I have indeed acted or I have not. If hundreds of Mainas that believe they had information to offer as far as the protection of the national interest is concerned, I will meet them and I will do so again,” he said. When asked why the Federal Government had refused to release the leader of the Islamic Movement of Nigeria, Ibrahim El-Zakzaky, he claimed the overall interest of the public must be considered before obeying court orders. He added that this was the same reason the embattled former NSA, Sambo Dasuki, was being kept in custody despite several court orders.